2. Using paper towels, pat the roast dry and season it liberally with salt and pepper. In a large Dutch oven set over medium heat, heat 2 tablespoons of the oil. Add the roast and brown it on all sides, 8 to 10 minutes. Transfer the roast to a cutting board or a large plate. 3. Add the remaining 1 tablespoon oil to the pot. Add the onion, potatoes, carrots, parsnips, garlic, and thyme, and season with salt and pepper. Cook until the vegetables start to brown, 5 to 10 minutes. Add ½ cup of the wine and cook, scraping up any bits from the bottom of the pot, until reduced by half, 3 to 5 minutes. Return the roast to the pot and add the beef broth and Worcestershire sauce. Bring the liquid to a simmer, cover with a tight-fitting lid, and put the pot in the oven. 4. Roast the meat until fork-tender, flipping it once halfway through, about 3½ hours. Transfer the roast to a large cutting board, tent it with foil, and let it rest. Using a slotted spoon, transfer the vegetables to a serving platter. Put the Dutch oven back on the stovetop over mediumhigh heat. Add the remaining ½ cup wine, bring to a simmer, and cook until reduced by half, 5 to 10 minutes. 5. Strain the sauce and season to taste with salt and pepper. 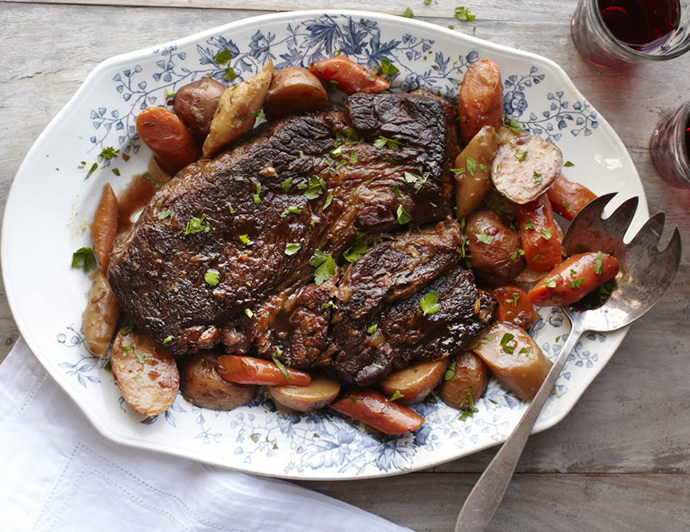 Shred the pot roast into big chunks and transfer to the platter with the vegetables. Sprinkle the vegetables and roast with the parsley. Reserve 1 cup of the sauce to pass when serving and pour the remainder over the vegetables and pot roast.